NEW TAKE-OFF TIRES HAVE ARRIVED! Take-off tires are tires that been taken off from new cars. This is done when a new set of wheels and tires are installed and the original tires are traded in. Most of the time this is done at a dealership or car tuner. In the majority of cases, the tires are in “like-new” conditions with very few miles actually driven. Why Buy Take-Off Tires ? You can save up to 50% off retail price when compared to new tires! 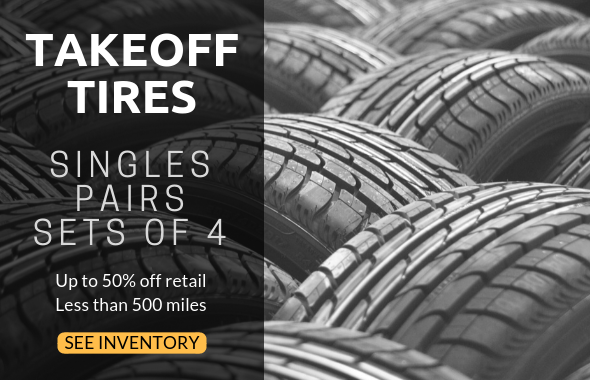 We sell take-off tires from all the world’s top manufacturers including Michelin, Goodyear, Dunlop, BFGoodrich, Firestone, Continental, Falken, Hankook, Pirelli, Toyo, and more. Replacing your tires with high quality tires has never been more affordable. Our tires have up to 99% tread life remaining. Finding your tires never being easier! You can purchase single tires, pairs, and sets of 4. If we don’t have the exact tire in our inventory, we will recommend another tire that matches your vehicle’s specifications.